A November, 2010 article in ADVANCE for Physical Therapy & Rehab Medicine (dated 11/29/10) documented the results of six case studies in which infants and children were treated with precut kinesiology tape for various neurological and developmental conditions. The article, entitled “Tales of the Tape: Case Studies on using Taping in Pediatric Care,” provided detailed descriptions of each child’s condition, taping protocol used, and outcome. The case studies, completed at Texas Children’s Hospital, covered problems ranging from neurological injuries and illnesses to developmental delays. In each case, the child’s own primary physical therapist did the taping, applying precut kinesiology tape strips in the most appropriate manner and location(s), based on the patient’s individual diagnosis and clinical presentation. Some cases required the “Y” precut kinesiology tape strip configuration, some the “I” configuration, and some both. While different therapists did the tapings, the standardized tests were administered pre- and post-taping by one therapist to ensure intra-rater reliability. Specific standardized tests used depended on the condition being treated through precut kinesiology tape strip application and therefore varied among the subjects. 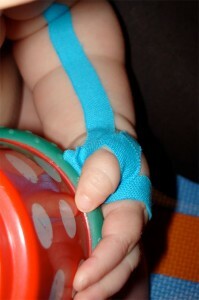 Case 1, a two-year-old male, diagnosed with developmental delay, showed a significant improvement in his ability to “sit independently and reach for a toy without upper-extremity support” after being taped using both “Y” and “I” precut kinesiology tape strips. Case 2, a one-and-a-half-year-old female with a diagnosis of spina bifida and Arnold Chiara malformation 2, experienced improvement in hip alignment, proprioreception, and ability to activate her abdominals after receiving both “Y” and “I” taping in the affected areas. Case 3, a three-year-old male, diagnosed with Prader Willi syndrome, demonstrated slight improvement in the sitting dimension and the walking, running, and jumping dimension, along with vast improvement in the standing dimension of the test, after his therapist used precut kinesiology tape “I” strips to facilitate muscle activation and bilateral foot alignment. Case 4, a seven-year-old male suffering from DiGeorgi syndrome and spina bifida occulta, showed improvement in various combinations of reaching, elevating, grasping, and pointing, after the “‘Y’ and “fan” taping configurations were applied to his right wrist and extended fingers. Case 5, a six-year-old male with perinatal frontal lobe stroke, experienced a less-labored gait while walking after his therapist used precut kinesiology tape “Y” strips to facilitate muscle activation. Case 6, a three-year-old male with bilateral clubfeet, improved in four of eight areas – demonstrating increases in both balance and function – after being taped using the “I” configuration to assist with dorsiflexion. Two other, higher-functioning patients exhibited no improvement in their already high test scores after taping with precut kinesiology tape.